DeSmog Blog headed back to obscurity | Watts Up With That? The blog that broke created the Fakegate story, only to have it blow up in their faces when skeptics fingered Peter Gleick as the culprit, forcing him to admit that he’d been the one to steal the documents from Heartland, has had its 15 minutes of fame, and is now headed back into Internet obscurity. 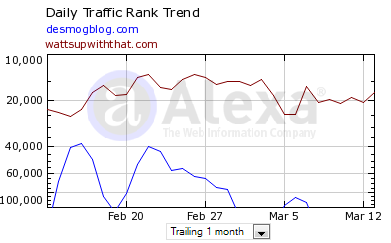 On the graph below, one can clearly see the traffic spikes of Feb14th, when the story broke was first marketed, and Feb 2s1st when Gleick confessed made his limited hangout. Since then it’s been downhill for DeSmog. That’s what is known as a “dead cat bounce”. Even more cowbell Chris Mooney articles don’t seem to be helping DeSmog. After this fiasco, I hope David Suzuki starts to wonder why he’s (allegedly) funding those guys. I’m guessing that there will be another traffic spike for DeSmog in the not too distant future, when indictments and lawsuits are handed out. Anthony, with all due respect, somewhere in cyberland there is probably a real “David Susuki” who does not deserve to have his name tarnished by association with DeSmearBlog! OTOH, David Suzuki deserves every opprobrium under the sun. Hello…………….. is your scale right side up? woops…………… It is sorry. I was thinking count not rank. the not too distance future, when indictments and lawsuits are handed out. Please do tell, seems some insider information? This blog is going sideways with it’s concentration on the Heartland Institute documents. OK so Peter Gleik acted dishonourably, but what effect is this having on the international debate on anthropogenic climate change? Probably not a lot. Can you get back to focussing on articles that deal with the scientific aspects of climate change and spend less energy on irrelevant side issues? Sorry to disagree Ian. I personally find this whole episode fascinating and would like to continue to have it followed closely by WUWT. There is no other news source where I can get this information. And there is plenty of science to go around. Most of the articles do focus on the science. 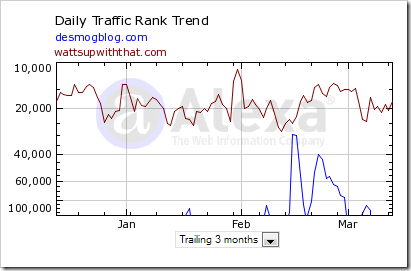 Whatsupwiththat.com may have been responsible for the spike in traffic at desmogblog.com. I never went there before WUWT pointed me too it. Goes to show that the average Jill/Joe has a good BS detector? Sideways? 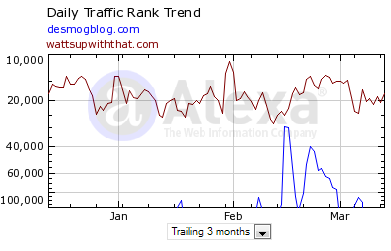 Looking at the alexa rank, yes it is. WUWT is maintaining a very healthy position in the top 15000 to 25000 websites worldwide. That in itself is a very impressive statistic. I was looking at the Alexa data and I saw that Honduras loves this website, with this website being 382nd there, compared to about 18000 everywhere else. Does anybody know why. One Honduran was interested in the Gleick affair. You forgot to mention that you’ve been reading WUWT for years, but now you don’t know whether it’s still as good as it used to be; that’s a standard necessity for concern troll posts. I’ve seen repeated claims that WUWT “trolls” are invading a blog here or there…..
Will they blame WUWT trolls for their demise because we didn’t visit?? On the Honduran connection….Makes one wonder if there isn’t a bot that links through a proxy in Honduras that keeps their count up? ;0) now that comment made my morning Anthony many thanks!! I’m guessing that there will be another traffic spike for DeSmog in the not too distant future, when indictments and lawsuits are handed out. Why don’t Warmists realise that one of the reasons why sceptical blogs do so well is because there is no free debate in the media and the media are biased. When you try to supress contradictory evidence then people start to become suspicious and look for themselves as the media has largely failed in its duty. They (Warmists and media) are helping to SPREAD scepticism IMHO. 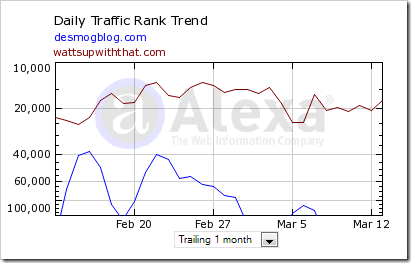 Once again, better traffic rank does not make WUWT right and DeSmog wrong. I think it’s more matter of supply and demand – there’s so much warmist information on the net, in media and everywhere that nobody needs to check it up anymore despite the fact that every average Joe in the world believes in global warming. WUWT provides low profile commodity to specialized group of customers, that’s what makes the difference. And that group is large enough and hopefully growing. Sometime in the future hopefully the ideas presented here on WUWT will become widespread and people will start taking them for granted. What will happen then? WUWT rank will go down where ranks of sites you are laughing at now are. At the time of victory WUWT will be no more needed. Looks to me like they are still convinced that sceptics are successful because there is a well funded denialist machine even though the evidence is overwelmingly against it. Gleick even repeats the meme in his confession of obtaining documents that disprove the meme. Kinda makes one wonder if they have any ability to draw a rational conclusion from evidence at all. That says it all! (Funniest exchange all year!). Anthony has to change the scale … not as the warmists do to exclude the information and exaggerate their case … but to include the other side, even if it means giving them more significance than they deserve. Well I like to think it is because Honduras has some free-thinking freedom loving citizens. After all, they successfully resisted a soft coup promoted by commie neighbor Chavez and our own President Dumbo and Madame Hillary by sticking to their Constitution and arresting the SOB. This was some accomplishment if you remember, because all the forces were arrayed against them at the time. Considering the fact that the same team later oversaw radical Muslim takeovers of quasi-friendly countries like Egypt while leaving others like Iran alone, this Herculean feat by the Hondurans looks all the more spectacular. President Dumbo likely has a world map in the oval office where he is placing little red flags in all the places his team endeavors to install Anti-American regimes. To our Honduran amigos I say: watch your backs! Your the one that got away. DeSmog chokes Suzuki on ride back to obscurity, may have to walk to court. Just a couple of observations after seeing some back and forth on concern trolls and Anthony sticking to the science. #1 – This is Anthony’s blog and he can post what he damn well pleases. I come here every day because he covers all facets of these important issues: science, politics, ethics etc. Science is reasoning and rational thought – the use of logic and reason to understand the conditions of our existence. All human beings are scientists to a certain degree; we have to be else we perish. I believe this is why he has such a vast and consistent appeal, and it is heartening to see that so many people can think independently. #2 – Opinions are like —holes, everyone’s got one. This is a great place to express one thanks to Anthony and the moderators. It is also a great place to debate, but the second an ad hom shows up, the debate is over; an ad hom is not a debate tactic, but an attempt to avoid debate. I come here more for information (and entertainment) than anything, and I rarely comment. This seemed like a good opportunity to express a somewhat insignificant opinion. Thank you Anthony and moderators for maintaining this bastion of sanity. Why don’t Warmists realise that one of the reasons why sceptical blogs do so well is because there is no free debate in the media and the media are biased. Because if they did, they wouldn’t be Warmists. … but let’s talk about it, eh? Blogosphere babbling. I commented earlier that I thought WUWT was going sideways with its concentration on Fakegate an opinion which, surprisingly, generated some ad hominem attacks. Read what the MSM in Australia says about the Heartland Institute and Professor Bob Carter. The newspaper in which this was published is Australia’s national newspaper and reaches a wide audience. It is this type of article with which WUWT has to contend. I don’t recall seeing a discussion piece on WUWT on how carbon isotopes are used to show the origin of atmospheric CO2 or of the reliability of this approach. Such an article would be very useful for informed discussion of this type of piece in the MSM. It would be appreciated if those who think ad hominem attacks substantiate their position on climate change, can indicate what in this particular post is evidence of trolling. Never type faster than the spell checker! I commented earlier that I thought WUWT was going sideways with its concentration on Fakegate an opinion which, surprisingly, generated some ad hominem attacks. The first response and second responses to your post were actually quite subtle, tame even. The third post simply identified the requisites, the criteria for ‘concern trolling’ which you take as “ad hominem attacks” (but which criteria you did not meet). It would be appreciated if those who think ad hominem attacks substantiate their position on climate change, can indicate what in this particular post is evidence of trolling. Ironically up until this post I was on Ian’s side, In that wile I didn’t agree that the Gleick/DeSmog affair wasn’t apropos, I could understand why someone might think so, and should be able to state such belief without being branded a troll. This latest post of his however does seem to be a clear attempted at derailing a discussion that he personally doesn’t agree with… therefor Troll. PS: Can someone tell me what the article that Ian linked to is even about? Ian doesn’t say, and It’s apparently paywalled. Just using ad hominem makes you smart. Throwing the word “attacks” on the end makes you a Latino auténtico. As to your contention that Anthony’s weblog has never discussed “how carbon isotopes are used to show the origin[sic] of amospheric CO2”, it is painfully obvious that you are a concerned Christian conservative who is worried about the image of websites such as wattsupwiththat.com and I’m sure that Anthony would thank you personally for your concern and perhaps even send to a badge of honour for your concern. moby. Have you heard about the straw that broke the Camels back. Well what we are achieving by shining the light on the AGW fraudsters dark and dirty underworld is exactly that, slowly but surly the Camel (Warmist) are feeling the weight of the Skeptics thrust and parry. Trust me we are winning. Only last night on the CBC Global warming alarm central, the leftist CBC Radio in Canada talked about the high bird count kill by wind power (Raptors, buzzards and Vultures) and how/why it was happening in Spain and Portugal, where for years they have been spending LOTS of time and money trying to bring back these endangered birds and now they are threatened again (Green insanity prevails yet again) they then cross referenced it to wind power projects in Canada and will it be a big problem? the answer was yes! For the CBC this is a faltering step towards examining what is really good and what is disgustingly bad about some aspects of the green movement, the foot is in the door! The light shone on de smog and burned it off. “Last year CO2 levels reached 390ppm and they are increasing at 2ppm a year. Should we be worried? Not according to sceptics such as Bob Carter, a former head of James Cook University’s school of earth sciences. He says he has seen no evidence that the climate change that is occurring is caused by human activity or is dangerous. “In their joint report this week on the state of the climate, the CSIRO and BOM argue “that the dominant cause of the observed CO2 increase is the combustion of fossil fuels” – that is, it is not due to natural variation. They arrive at this conclusion from looking at the change in the composition of atmospheric CO2, as measured through isotopes; that is, different forms of a chemical element. This identifies the burning of fossil fuels as accounting for more than 85 per cent of CO2 emissions caused by human activity, with the next biggest factor, land use change, mainly deforestation, responsible for less than 10 per cent”. As you can see this is quite a spray against heartland and those who are dubious obout the causes of climate change. Or when .001% of your readership decide to see what the heck desmosmog is. Thanks for the Extracts Ian, although I’m not sure how this article is supposed to aid your position that Gleick/DeSmog is a distraction for WUWT. I’m also not sure what is meant by ‘spray’, although I will admit that the first thing that came to mind was the flecks of spittle flying from the typical foaming at the mouth Eco-reporter. As long as the MSM continues to give us ‘sprays’ like this, and continues to give excuses for the behavior of people like Gleick, Mann, Hanson, and all the rest, It will continue to be a topic of discussion anywhere that skeptics gather. I found WUWT barely a month before Fakegate happened. Prior to finding this site, I was a head-in-the-sand kind of person. I knew the whole fry-and-die alarmism was wrong, the claims were getting very stupid, as was the panic. Getting fed up with ever increasing nonsense scare tactics, I pushed back from news outlets. I didn’t want to hear anymore. I also felt very alone. It was Ian Plimer’s “How to get expelled from school” that opened my eyes to the growing fight back to rational thinking. I bought the book (and there were only two left on the shelf, so I know it’s popular) and read it in a day. Encouraged, I got online and found WUWT and others. I cannot express how wonderful it felt to learn that REAL scientists out there are practicing REAL science and presenting it properly. Point is, for those years I had my head in the sand, I didn’t know just what a tangled mess this had all become. I didn’t know what a horrible world was developing right under our noses. I come here every day. This is my home page. I love the science, I love the way it is presented and I love reading the comments and thoughts from so many very intelligent people. But I also devour any news on the political front. I crave and seek out every snippet of good news, and believe me, this is good news. Anthony, I want to see these dastards go down. I came in at a most exciting time and I want to watch every step of the alarmists fall from grace. Thank you for providing the whole picture, the wide picture, science, politics and all. Some of these comments are just hilarious. Then again I think anyone who believed in Magic Gas was hilarious from the start, and still do; those hicks at DeSmogBlog are among the most evil of lying liars, and they themselves, the liars that tell them, do NOTHING: but LIE, LiE, lie. Like a rug. Indeed like an extinct, Darwinized warmer skin on the floor of a real person’s house. That’s how I feel about warmers. They shall be extinct, sayeth Darwin and the Synthesis he eventually engendered. I think you have it. Our internet connection is via satelite and sometimes when I enter a site a little pop up will say “welcome to X from” and give a town’s name 80 miles to the north of us or 80 miles to the south of us but never a town close to us. Actually it was this point, or more accurately your post at 8:56 am, that originally changed my mind and convinced me that you were just a troll. As I stated then, I had no problem with your stated belief that the Gleik/DeSmog affair was distracting WUWT from more important matter. You are entitled to your opinion, and shouldn’t be belittled for stating them. What I did have a problem with was your repeated attempts to derail the discussion onto other matters. That was most assuredly Troll like behavior. And the fact that the MSM article you linked to uses the Heartland documents (including, it would seem, the fake one) in an attempt to discredit Skeptical viewpoints, without once mentioning Gleik or how he misrepresented himself and the documents when he sent them to DeSmog Blog, is hardly representative of his importance in the discussion. We already know that the Warmists would prefer to slander Skeptics with imagined connections to ‘Big Oil’ without having to worry about the fact that their evidence was manufactured. Pointing this out for us doesn’t help your position any. What was your position again, anyway? Oh Yes, that we need to forget about Gleik, DeSmog Blog and Heartland, and instead focus on the important matter of how carbon isotopes are used to show the origin of atmospheric CO2. As I understand it, (and I admit I may not) Coal and other fossil fuel Hydrocarbons have a different percentage of Carbon Isotopes then ‘natural’ Carbon molecules, and thus can be fingerprinted in the atmosphere as having an anthropological origin. Well, so what? Was there some doubt that we were producing CO2? Did we think our CO2 was magical and didn’t enter the atmosphere like all the natural CO2? Is there some reason CO2 from burning Coal doesn’t enter the Carbon Cycle like all the rest of the CO2? Why should I care about this information? Simple stated, the fact that some of the worlds CO2 comes from burning Fossil Fuel isn’t in question. We already know this. What we don’t know is what effects adding this CO2 will have on the biosphere and climate. We don’t even know for sure if the increase in atmospheric CO2 is based, in whole or in part, on fossil fuel CO2. I’ve read that the amount of increase in atmospheric CO2 is about half that of what we believe we actually produce each year, so some of it at least is being absorbed into the Carbon Cycle with no problems. Is the rest just too much for the environment to handle? Or is the natural warming of our world reaching the peak of the current Interglacial just releasing enough natural CO2 to saturate the sinks? I have no Idea. I’m just an Appliance Installer. That’s what I come here to find out. And I have to come here to find out because (coming full circle) the alleged Scientists who’s job it is to find out important information like this are to busy trying to remake the world to there liking. And as we’ve seen over and over again the have no compunction against lieing, faking data, slandering opponents, or any other dirty trick to advance their ’cause’. THIS is why the Gleik/DeSmog affair is important to the discussion. Because as long as they are willing to lie, and as long as the MSM are willing to accept their lies, any discussion of climate change will have to be considered in the shadow of those lies. Funny, the number of people who have “been coming here for years” posting under names I don’t recognize. I realize that people lurk, or that they may not post that often – but I think even *I* am a name recognized by the regulars, even though I don’t post very often. After a couple years, you get an idea who’s hanging around. 1. Why it’s a problem for WUWT to continue to discuss the fraud, theft, dishonesty, forgery, and defamation perpetrated by DeSmogBlog and Peter Gleick? 2. Why WUWT should instead waste their time rebutting a non-scientific OpEd hit piece written by some obscure Australian columnist and stuck behind a paywall which seems to be little more than a regurgitation of the stolen documents and forged propaganda pushed by DeSmogBlog and Peter Gleick that you want WUWT to stop discussing? To be fair to “The Australian” they do carry both sides of the argument. I’ve read quite a few articles in it denouncing warmist hysteria. I can understand, that you would like to see more direct science based articles and pure debate on those issues, rather than “side issues” of people behaving badly and the need to take them to infinite task and account. Nice sentiment, but the fact is this has been an idealistic struggle with the politics strangling the science, done under the guise of science and saving the world. It really took us mild well mannered sceptics a long time to recognise what we were up against. Only now. we are exposing the extent of the issues and pushing to get science back to the respect and authority the “team” destroyed. They spun bad science and politics for short term gain, a gain now exposed as willing scientist’s grunting accent with their noses firmly “hogging” the trough of research funding, while serving the aims of certain political agenda. You have rightly highlighted the current situation in Australia, a political situation involving a small group of organised “scientist’s for the cause”, much like Americans faced five years back, but now under greater scrutiny by sceptical scientists and the voting public (thanks to Anthony and others). If you feel a need to start back where Anthony started and create an Australian mirror site in conjunction with Anthony, Jo Nova, and other sceptics scattered all over Australia, this is the (your) opportunity and of course you can then promote the content you see a need to promote in the interests of true science. Western Australia is a good place to start a blog with these ideals in mind. Working closely with other sceptical blogs would speed up an ideal outcome for good citizens and scientists alike. In four or five years I would hope that you reach the results and probably the same decision point that Anthony has. Perfect comeback regarding the log scale, Anthony. I choked on a grape! As for those who fall back on the intellectually empty “concern troll” meme against those of us who are truly concerned, just know that while you may think you sound sophisticated and adept at the repartee of climate debate what I hear is the twin babble from the inbred offspring of inbred parents whose secondary education came at the expense of taxpayers funding Sesame Street and whose haberdasher knew only enough math to count the buttons needed for your drop drawer suspender overalls you wore at your advancement ceremony. And so you know, indoor plumbing is not only for washing your sock or brushing your tooth. Thanks Troed Sangberg (12.23 am). I wasn’t really looking for a discussion on human CO2 levels just wondering if a blog on the isotopes of carbon might be of interest. That said, I am aware that the reason CO2 is implicated is due to the climate models rather than to any empirical evidence from experimental observations. As you will have noted from a recent addition to this blog, Michael Mann has been given considerable exposure in Australia by the ABC which is national broadcaster. This coupled with the hatchet job on Lord Monckton by a reporter for the ABC and the recent pro-AGW piece in the national newspaper, indicates how much the public in Australia is being influenced by the proponents of AGW. Responses to this type of article that can quote the appropriate reliable scientific facts are far more effective than responses giving general comment on matters such as Climategate however justified these comments may be. 2 The “non scientific oped piece by some obscure Australian columnist” you so deride, reached, at least, some 800000 Australians according to the circulation figures for the newspaper. This of course does not include those who read the paper on line or access a copy of the newspaper they didn’t purchase. Although WUWT is, deservedly, a very successful blog I doubt that it gets that level of exposure in one hit. That is the power of MSM and that is why “non scientific OpEd pieces by some obscure Australian columnist” are of significance. Well to Ian of Fremantle I’d just point out a couple of things you may have missed. I had followed the Mann hockey stick debate out of casual curiousity from its early days and took somewhat with a grain of salt what one might well have viewed as a conspiracy theory by a small band of skeptics about the mainstream climate science and its scientists. While feeding white noise into hockey stick models and producing same spelled the obvious, when the Climategate emails broke there before my very eyes was everything those skeptics had surmised so succinctly for so long. Frankly the general populace via the MSM were largely kept in the dark about that, but the increasingly lunar statements about weather events and similarly lunar Green policy prescriptions was what really broke Big Climate’s back. Read that last line in particular and now you tell me why Gleick is still free to roam the streets when that bloke isn’t, all things considered? WUWT doesn’t need to comment on articles like those written by Mike Stekete because a few seconds of searching will point to articles like this one http://wattsupwiththat.com/2008/01/28/spencer-pt2-more-co2-peculiarities-the-c13c12-isotope-ratio/ (sorry couldn’t make this into a link for some reason) that puts that kind of non-researched commentary firmly in its place. I wrote to the Editor of The Australian about this as well. Any issue of fraud related to the AGW discussion is as relevant as any scientific discussion because the battle is not currently being fought with scientific arguments. I read The Australian every day and not withstanding that they have declared, on a number of occasions, that their Editorial position is pro-AGW theory they rarely carry any of the major scientific announcements and discussions. While they may the best of a bad lot that does not in any way make them balanced on this issue. At a given temperature, the concentration of CO2 in the air above the liquid in which it’s dissolved is in quasi-equilibrium, essentially regardless of the isotope. On a larger scale, where the water is in the oceans, etc or our climate system, CO2 produced within the atmosphere thereby impedes the gassing-off of dissolved CO2 that would otherwise occur at that temperature. If we don’t add to the CO2, then the quasi-equilibrium is established by CO2 coming out of the water. “Excess” CO2 at the water’s surface is dissolved in the water, neutralising somewhat the basic/alkaline oceans. I was going to post a comment regarding your original concerns about WUWT following the Gleick affair. But I think that the comment posted by Ally E. is a much better reply, so I’ll just point you there and leave it at that. The “non scientific oped piece by some obscure Australian columnist” you so deride, reached, at least, some 800000 Australians according to the circulation figures for the newspaper. This of course does not include those who read the paper on line or access a copy of the newspaper they didn’t purchase. Although WUWT is, deservedly, a very successful blog I doubt that it gets that level of exposure in one hit. That is the power of MSM and that is why “non scientific OpEd pieces by some obscure Australian columnist” are of significance. You confuse the claimed circulation numbers of a particular newspaper with the number of people who have read a particular OpEd piece that appeared in an issue of that paper. I will guarantee you that nowhere near 800,000 people read that article. You also ignored the fact that this obscure single-paper, non-scientific opinion column was little more than a regurgitation of the stolen documents and forged propaganda pushed by DeSmogBlog and Peter Gleick that you want WUWT to stop discussing. The “power of the MSM” is in its relentless repetition (e.g. as the OpEd in question does with the falsehoods Gleick and DeSmogBlog vomited forth). It would be wasteful for WUWT to abandon scrutiny and criticism of the source of these falsehoods as you suggest and instead spend its time trying to rebut every specific repetition of these falsehoods individually. I still don’t see how you can in good faith claim that WUWT has “gone sideways” by continuing to discuss the fraud, theft, dishonesty, forgery, and defamation perpetrated by DeSmogBlog and Peter Gleick while simultaneously deriding WUWT for not addressing a rather banal individual instance of the regurgitation of those fraudulent claims which appeared in one paper’s OpEd section. Your two stances are completely at odds with one another. Like I said, Ian is just a Troll. And like all Trolls, once you prove them wrong the just make some ad hominem and announce that the argument is over and that they win by default. So, let me reply in kind. Yes Ian, Take your ball and go home. We weren’t interested in it in the first place. Just don’t expect us to join you the next time you show up demanding that we play your game instead of what we were already doing. All Right, I’m done feeding the Troll. Troll mission (thread highjack and deflection) successful. As for the press in Australia, it’s a minor symptom of the Gawd-awful mess you elected yourself into. Fools and their freedoms, and all that. Ha. I’ll admit, I thought that myself. It’s so hard to avoid feeding the Trolls, even when you should know better. Ian, give it up, so far it appears you’ve had 9 fights for 2 loses and 7 utter thrashings. Personally I love seeing these AGW quacks get poisoned on their own snake-oil and seeing PR hacks lose their relevance, I also enjoy seeing the bridge fall on trolls heads. I can tell a bit about you, you are a middle-class Statist, revealed primarily by your meaningless argument that you believe successful Anthony’s blog should not follow his whim but your anonymous opinion ! He, not you, has to date the winning formula. If you don’t like his direction, start your own blog mate – or don’t you want to put in the time and hard work that Anthony has put in ? Is it envy of his ‘hits’? Why would he change except to appease thermophobes ? And what are the “scientific aspects ” of climate change you want ? Perhaps, Hansen’s comical raving that the “seas will boil” or Mann’s ‘hockey stick fraud’ or maybe Gore’s oxymoron of “settled science” or how about data perversion on all continents or the revelations of Climategate 1 and 2, or the worlds leading authority on all things warming, the IPCC using WWF opinion as fact. AGW is no longer scientific, it’s the material of a future ‘socio-comedy’. This isn’t about science mate, its about the politics of fearful, controlling and fear mongering people who anoint themselves our superior but constantly prove themselves inferior to the ordinary man. The fact that they need to lie, use fear, manipulate, deceive, attack the man, slavishly appeal to authority, use the base PR spin of Orwellian newspeak oxymorons like “Carbon Pollution” or fantasy nonsense like “tipping points” and all the plethora of fear based hyperbole of us “drowning whilst we fry in storms” is just proof that they are incapable of convincing others by using right, truth, reason, logic or common sense to win the day. Those who need to deceive to convince must be by that nature, lesser people than those they seek to control. It not that ordinary people are too stupid to grasp it, it’s that they can eventually discern a con. Anyone who believes deceit is a valid tool of social influence is helping build a dystopia, not a better world. I work so I’m working class not middle class. I don’t know what statist means but if you mean a states rights advocate then I’m not. Yes I did get 2 losses and 7 thrashings or perhaps even 9 thrashings but so what? They’re not injurious and every one (even me) is entitled to their opinion. What you guys seem not to do however is read all sides of the argument on climate change Despite the antagonistic comments I’ve received here, I like WUWT and read it daily but I also read RealClimate and Open Mind. I hate to read the sneers of Gavin Schmidt and Grant Foster (Tamino) when they refer to posters on WUWT as “deluded deniers” or “ignorant trolls” and refer derisively to WUWT as “unscientific rubbish that seizes on any piece of denier material to justify its presence”. If that is what you want then fair enough but I think WUWT deserves much better.